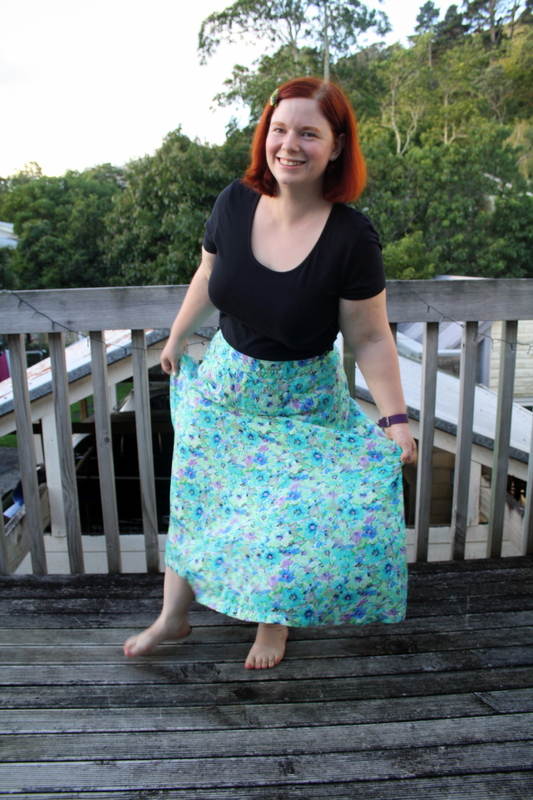 So, I made a maxi skirt. 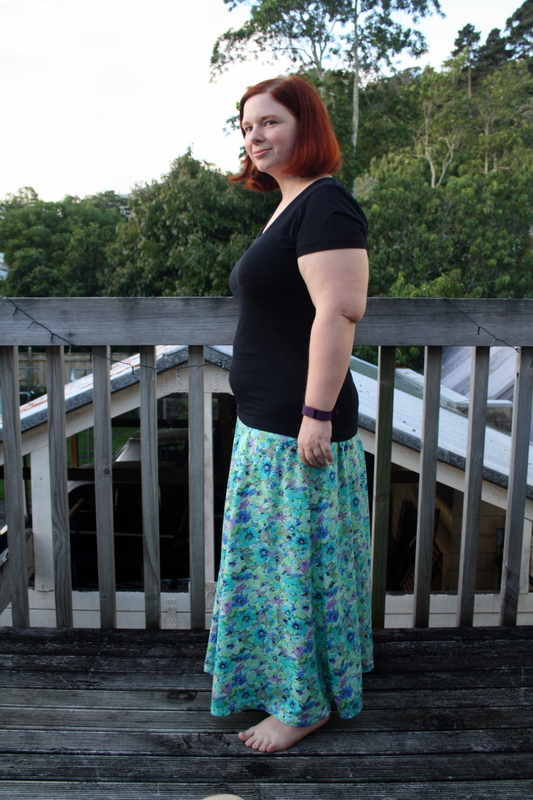 To be more precise, I made the Gabriola skirt by Sewaholic. I don’t know when or where I bought it, but I had the paper pattern – which is now out of stock on their website. This was quite the queue jumper, to be honest. 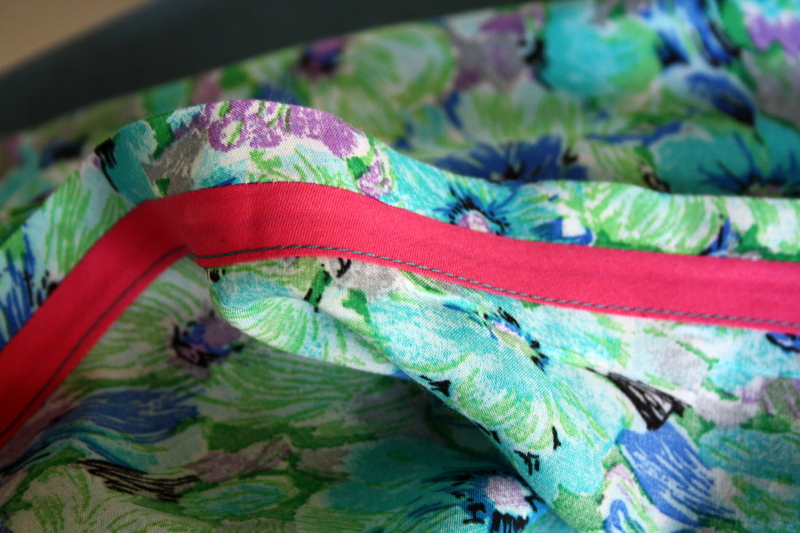 I’d found the pattern during a reorganisation of my sewing space, and a few days later I was in Geoff’s Emporium and found this lovely, summery rayon fabric for $7 a metre. 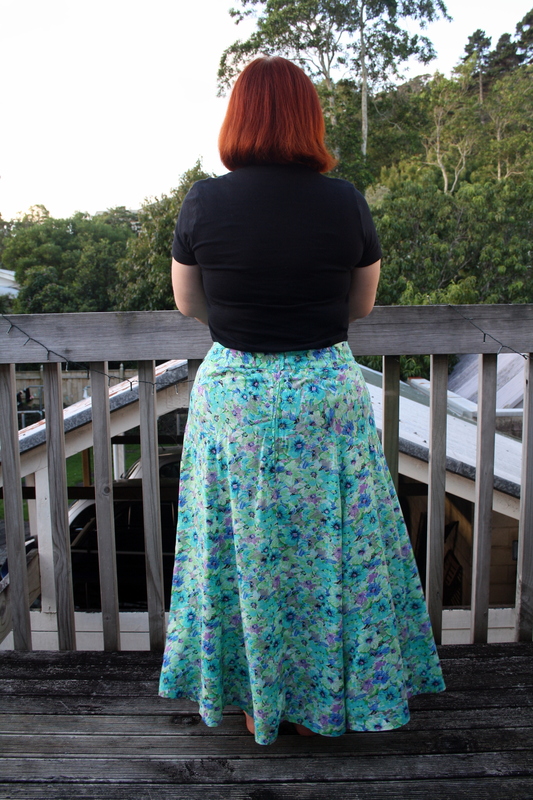 Since this skirt is a huge fabric hog (4.8 metres for version A at 115cm wide fabric), the price was right! As it turned out, I easily had 1.5m of fabric left, despite making the largest size. Slightly annoying, but I guess I’ll make a top or something out of the rest. I made a size 16. This was a mistake. My waist measurement, on a good day, hovers around 88cm. Since the size 14 finished measurement was exactly 88cm, I thought by making the 16 I’d give myself room to breathe, eat and be comfortable. Instead, I ended up having to take the waist in by 6cm, in the form of 4 1.5cm darts. It was huge. And even now, it’s looser than I would ideally like. I cut the length at the smallest size, because I am short (154cm), and I still needed to take it up by 6 inches. I was going to do this at the lengthen/shorten line, but it didn’t look quite right to me and luckily Mel and Nikki advised against it, and I took it from the bottom, to preserve the hip shaping. Making the skirt was pretty straightforward. The fabric didn’t shift too much, and it pressed nicely. I did French seams wherever possible for neat insides, and pinked the ones where I thought French seaming wouldn’t have worked very well. Well, I say it was straightforward – until I got to the zipper, that is. I had the perfect colour zipper in my stash (I have a huge vintage zip collection of all colours and sizes), but inserting it was like pulling teeth. I interfaced the zipper opening, I basted it in first…and it still took me 4 tries before I was satisfied with it. And even now, I’m not sure satisfied is the right word. More like resigned. I didn’t realise until I got to that step that the zip didn’t go all the way up to the top of the waistband. I hate hooks and eyes, so that didn’t thrill me. I ended up using some small nickel snaps I had from god knows where. 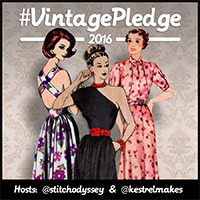 I let it hang for about 4 days before I hemmed it – I didn’t plan for it to be that long, but life got in the way. I ended up cutting another 2 inches off the bottom before finally hemming it the recommended amount. Luke kindly got on his knees and helped me pin it – I didn’t enjoy any of the hemming process, it’s a huge hem and I was worried the whole time it was going to be wonky. I did use hot pink bias binding though, because why not? Can I confess that I’m not really loving the skirt? I don’t know how to wear it! I imagined I would wear it with a tucked-in top, but it turns out I hate the way that looks (you can see what I mean at the bottom of this post). It’s so much brighter than anything I usually wear, and while I love how flowy and light it feels when I’m wearing it, I feel like I have no suitable tops to pair with it. I’m wondering if a looser fitting top, tucked in, would look okay. I’m desperate for open to suggestions. You know, since you don’t have a top to go with it, that’s a good reason to make a new top! I would go with a looser top tucked in or maybe even a crop top because you gotta show off that nice hip shaping somehow. 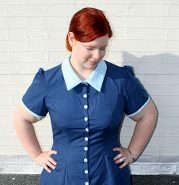 I’m imagining something simple with buttons down the front to establish your centre line. 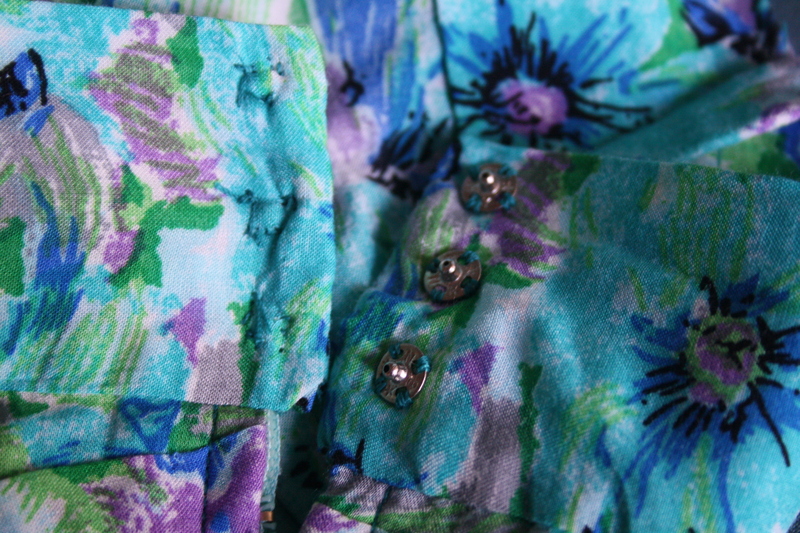 Yes, I think I’ll have to make a top 😉 Something simple with buttons…hmm, I’ll have to see what I have. There’s always the Aster blouse again, I guess. I’ll have a think. I don’t think a crop top is going to make it into my wardrobe any time soon though! I was wondering about a lighter coloured top…I always reach for black but maybe I should branch out. I’m going to have a look through my patterns today and see if I have anything suitable. I tried it with a singlet top but I really hate having my arms on show (even the t-shirt in the photos makes me uncomfortable) so I can’t see me ever wearing it like that, unless I added a cardigan. I think I do like the skirt, I just feel a bit unsure in it! 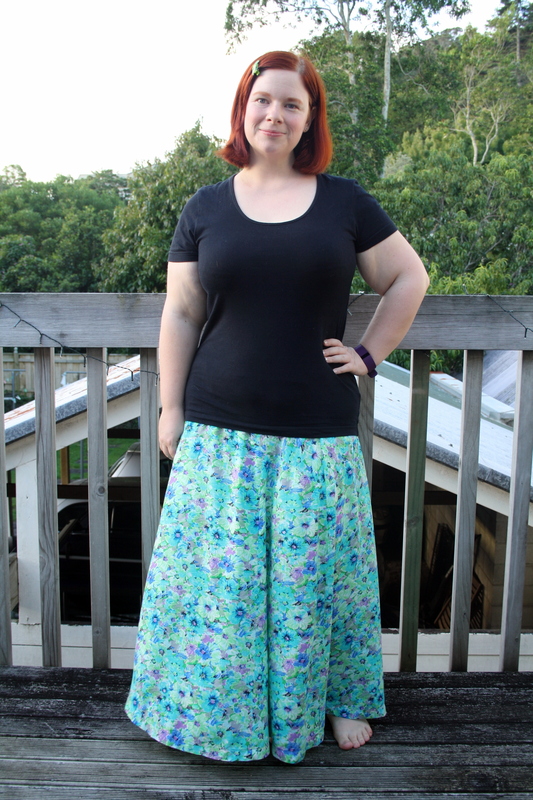 Thanks Mel 🙂 So many of you have mentioned the crop top now that I feel I have to at least consider the idea…I found a Lisette pattern that may work, but of course it’s nearly $20 (argh NZ).